The weather is forecast to be pleasant this weekend, so why not head out to try one of these events? Experience a new play performed on Chorley Covered Market at 8pm every evening. Under The Market Roof by Becky Prestwich is inspired by a series of interviews taken with those who work and shop on Chorley Market. 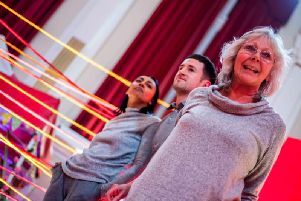 ​Under the Market Roof is a warm, funny, thought-provoking play about community, family, ambition and the connection we have to the place we live. Grab a barm, a pint or a brew and join Junction 8 Theatre for a unique theatrical experience full of Chorley spirit! Tickets are £10, available from Malcolm’s Musicland, Chapel Street, Chorley, tel 01257 264362. Please note there is no Sunday performance. Food and drink will be available to purchase on the market from 7pm each evening. To show their love for Blackpool and its Illuminations, LumiMakes are planning the first ever Carnival of the Lights. They’re looking for people from all walks of life to take part in an illuminated parade. But first there will be workshops where they will help you to make illuminated banners, decorate your clothes and accessories or even give your dog a bit of sparkle! It’s being held at Stanley Park Visitor Centre at 2pm. All materials, assistance and equipment is provided and you keep what you make! This is an annual event that brings together around 30-plus artists from the Lancashire region to display and sell their art in a central location. The artists will be present on both days to interact with the public and discuss their particular art preferences. It’s being held at New Longton Village Hall on Boundary Close in New Longton, Preston. Doors are open from 10am until 5pm on both days. A cafe will be open all day too. For more information call 01772 614270. Blackpool’s world famous Illuminations have captivated audiences for over one hundred years. This year they are inviting you to join their Heritage Guides as they introduce you to the Illuminations Collection, containing over 20,000 pieces from the 1920s to the present day including photographs, diagrams and beautiful original artwork showing the evolution of the beloved ‘Lights’. The Lightworks studio is at Shorebury Point. Tickets are £8 adults; £4 children. Tour at 11.15am. East Lancashire Concert Band (The Accrington Pals Band in 1914) will perform a varied concert but will recognise their unique connection with the Accrington Pals. There will also be a “Last Night at the Proms” finale. This promises to be an exciting event at a lovely venue. Tickets are £8 for adults and £2 for ages under 12. The music starts at 7.30pm at St Peter’s Church, Salisbury, Ribchester Road in Blackburn. For tickets call 01204 303971. Join the Victorian Ghost Hunter aka Stephen Mercer, author of Haunted Blackpool and founder of the local spooky events company Supernatural Events, who will guide you to some of the resort’s most famous, and most haunted, locations where you will hear tales of terror, mystery and the macabre as well as stories of the supernatural and of course ghosts galore! Family friendly. Meet at the front of VisitBlackpool Tourist Information Centre for a 7.30pm start. Every Thursday to Sunday. Preston Orpheus Choir is delighted to present its next concert programme for October 2017 - entitled Feel the Spirit. There is a focus upon all things American; including strong, stirring spiritual music with a touch of jazz. The concert will also feature mezzo soprano Lucy Vallis, pianist Paul Greenhalgh and the Preston Flute Group. It’s being held at The Salvation Army Church and Community Centre, Harrington Street in Preston. Tickets are £10 for adults, with ages under 18 going free. The concert starts at 7.30pm. Call 01772 735197 for tickets. From October until March, Martin Mere welcomes up to 2,000 whooper swans that migrate from Iceland to spend the winter in West Lancashire - a spectacle that is unique to the North West. The Swan Spectacular is centred on the daily feeds of the swans. They are creatures of habit and will instinctively fly in as they come up to feed everyday at 3pm at the new Discovery hide and 3.30pm in the Raines Observatory. Both feeds include a wardens talk. Call 01704 895181 for more details. The Worldwise Learning Centre at the University of Central Lancashire proudly presents the 11th International Film Festival. Screening award-winning movies from around the world in their respective original language (with English subtitle) on eight consecutive days. From zombie action to teenage road trip, there is something for everybody. It’s being held at the University of Central Lancashire in Preston from Monday, October 16 until Monday, October 23. Tickets are £3 for adults and £2.50 for concessions, with a Festival pass available for £15. For tickets call 01772 893155. Impermanent Durations: On Painting and Time is an experimental exhibition and collaborative project by four contemporary painters. The artists will work together in the gallery, responding to the space and reacting to each other to create an immersive installation. It’s at Nuffield Theatre at Lancaster University. It opens on Friday, October 13 with a Panel Discussion from 4pm, and evening event from 5.30pm celebrating the publication of a special issue of the Journal of Contemporary Painting. Held in the Crossroads Centre, part of the Fulwood Methodist Church building, there will be approximately 20 stalls of various arts and crafts by local crafts people. Demonstrations to include patchwork and quilting, Chinese brush painting, rush weaving and other crafts. There will also be some opportunities to have a try yourself. And there will be an arts and crafts competition on the theme of “Harvest” for all ages in a variety of materials. Admission is free. It’s being held on Saturday. Call 01772 718800 for entry forms and for more information. What better way to spend your Sunday evening than with a spot of jazz and some fine ale? Then head to the Ale Emporium, off Fylde Road in Preston, who are playing host to top jazz band Pinto Beans on Sunday. You can expect some cool and funky standards from Harold Salisbury on saxes and flute, Norman Helm on bass, Jonathan Hartley on the drums, and the unflappable Tom Vernon on guitar. The music starts at 9pm and admission is free.